We see in this prophecy a juxtaposition of Light and Dark. 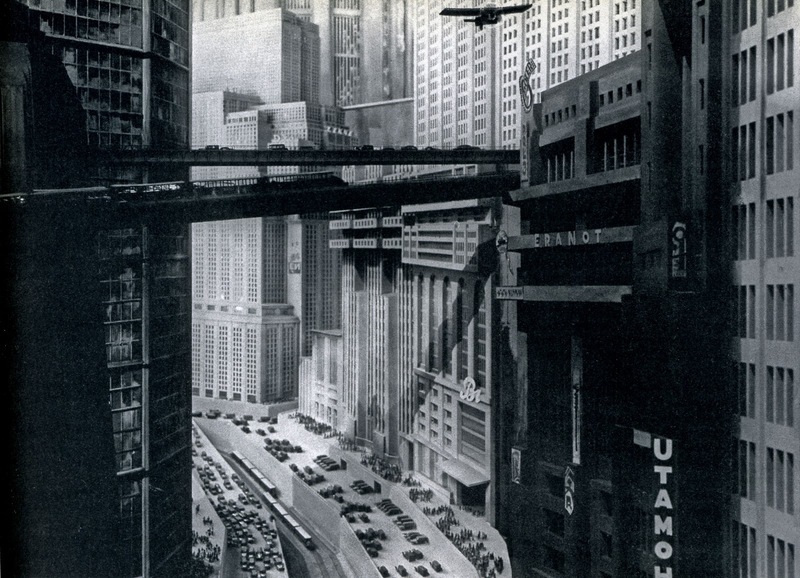 And I see the same juxtaposition in the classic 1927 film, METROPOLIS, which was on TV again last night. There are two levels of existence in the city: the workers in the lower levels and the masters of the city who live in the upper reaches of the city in magnificent skyscrapers and gardens of delight. Freder, the son of the Master of Metropolis witnesses an explosion in the machine that runs the city and immediately he has a vision of MOLOCH. In his vision, the machine turns into the gaping mouth of Moloch receiving workers as sacrifices. Moloch was a god of the Canaanites and Phoenicians, to whom parents sacrificed their children. The vision is Freder’s moment of transformation and decision. He saw the darkness underneath the city and decided to fight it from within. He went directly against his father! Likewise, the temptations were the experience of transformation and decision for Jesus! He saw the darkness at work in the world and rejected its power. It was the moment when he chose what the purpose of his life would be. 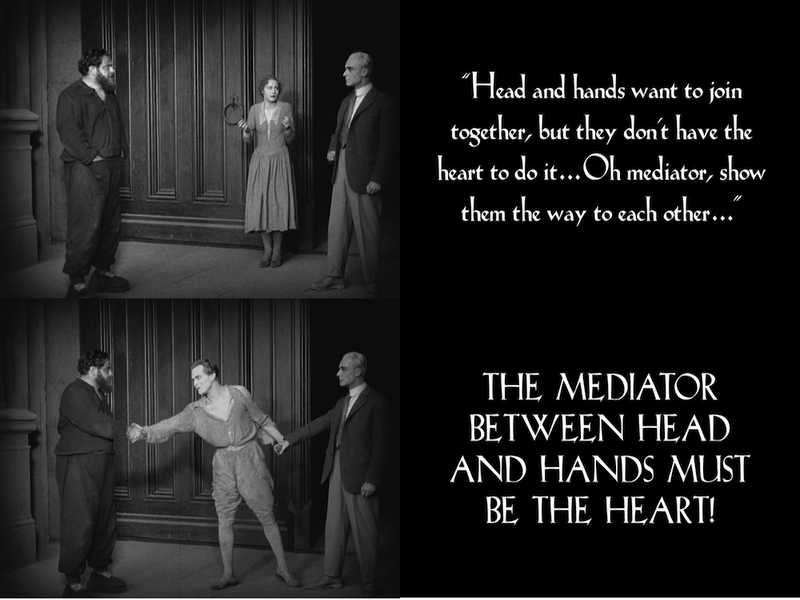 The primary message of the film shows up in the inter-titles (remember, this is a silent film) a few times, including the very end: Head and hands need a mediator. The mediator between head and hands is the heart. Wait for him, he will surely come! Freder becomes the mediator! You’ll have to see the rest of the film to find out how it unfolds. It is full of biblical references and images, especially from the Book of Revelation. I couldn’t help but see parallels with our gospel reading today. The people that walked in darkness have seen a great light. The light is Jesus. He is the mediator. He is the heart that has been missing from the world. The mind behind the universe is God. And humans have proved to be very capable hands in handling what the mind of God willed into existence. Sometimes the hands have done good, sometimes evil. But the hands have been very busy. The mediator is the heart of the world. Without the heart, God and humans are disjointed, out of sync. This is the reason why human hands do evil in the name of God. We saw it again last week in Paris. Those murderers saw themselves as the hands of a vindictive God. They believe they know the mind of this vindictive God. That’s how all acts of evil are committed in the name of religion. Charlie Hebdo was targeted because it dared to expose and to mock what is hypocritical and evil when religion has no heart. The world needs more like Charlie Hebdo. Blasphemous? Then we need more blasphemy!! What is blasphemous is religion that has no heart, that has no room for the mediator because it presumes to know the mind of God. We need more “blasphemy” like Charlie Hebdo to expose the darkness! There are still people who walk in darkness – and very often they carry religious identities. Very often they think they are the hands that are doing the will of the head that they call god. We also are hands, but only if we search the mind of God through the mediator, the heart that is Jesus. Categories: Sermons | Tags: Charlie Hebdo, Jesus mediator, Metropolis | Permalink. On the other hand, the Guardian today posted a very interesting comment that advises against drawing too easy a contrast between light and dark, good and evil, etc. The world is definitely much more complex than what the Gospels or Metropolis portray. We must resist oversimplifications, and if I’ve been guilty of oversimplification in this post/sermon then I need to improve my grasp on complexity.